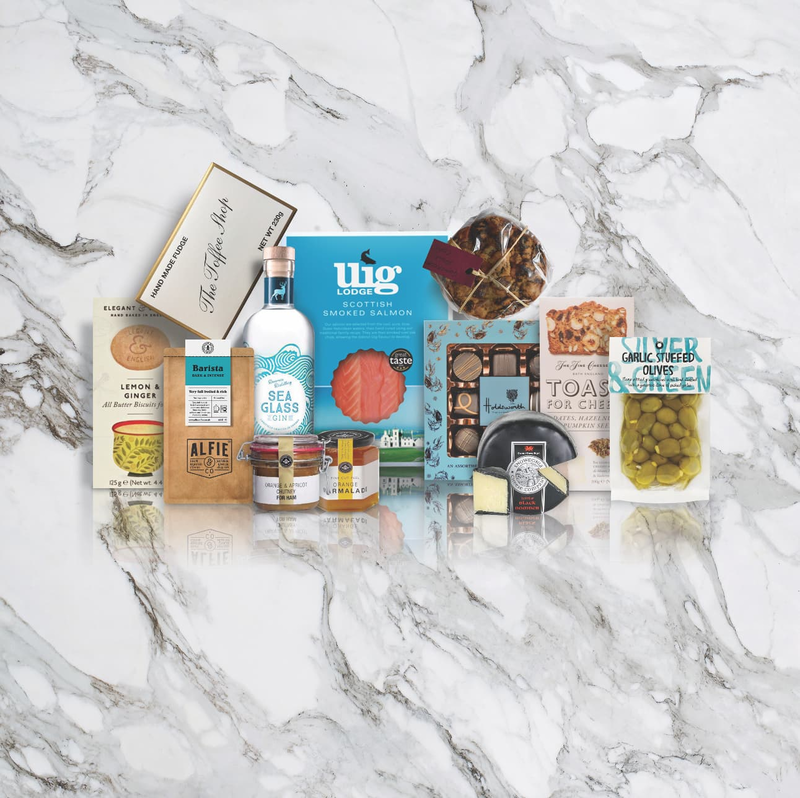 A carefully selected hamper of some of the finest flavours to be found. We have sourced some of the items from the Hebrides but we have also added some classics from the mainland! Delivered in an insulated box. 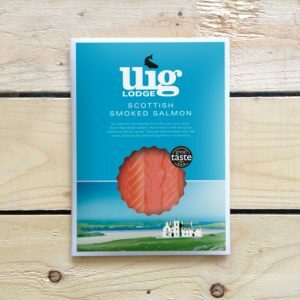 A hand-sliced half side of our award winning oak smoked Scottish Atlantic salmon. Perfect as a starter for 8 people. Handmade in small batches this fruitcake is flavoured with orange juice, zest and even a splash of brandy. Made with good, locally sourced ingredients. Traditionally made and will keep 6 months. Black Bomber Cheese Wax-covered (200g) A modern classic from The Snowdonia Cheese Company. Their flagship cheese marries a delicious rich flavour with a smooth creaminess, lasting long on the palate but remaining demandingly moreish! Alfie & Co’s Barista Coffee (250g) This dark and intense coffee is sure to wake you up on Christmas morning. Roasted in Scotland by a Alfie’s grandson. Garlic Stuffed Olives from Silver and Green (220g) The Silver & Green story began in 2007 when they decided to turn their passion for food and the Mediterranean in to a business. Their olives are delicious and large. Marmalade from Galloway preserves (220g) Their fine peel marmalade is the perfect way to start Christmas morning. Orange and Apricot Chutney for ham (230g) A great accompaniment to ham but also cheeses, cold meats and oatcakes. Fudge from The Toffee Shop (454g) in Penrith. This amazing, world-famous fudge is quite simply the best you can find. Elegant and English Lemon and Ginger Biscuits (125g). Refined, all-butter biscuits that go very well with a cup of tea. Holdsworth dark chocolate selection box (110g) These handmade truffles are very popular and will have you hooked. These biscuits are light, crisp, fruity and nutty! They would go very well with a slice of Uig Lodge Smoked Salmon.